Mike Smith was a winner at Ferry Meadows. The River Nene continues to produce some outstanding early-season sport thanks to the extra water coming through the system giving the river good colour and flow. Up at Stibbington anglers are reporting close to 50lb of skimmers on the pole fishing maggot over groundbait, with the hot pegs those below the railway bridge. Abbi Kendall with a good catch from above the locks at Orton. As expected barbel have been taken at Elton and also at Castor and Alwalton. One or two anglers have also had success with river carp from the Milton area right down to the town bridge. Even the city embankment has been in good form with reported nets of bream to be had on the pole or feeder. One of the most consistent sections has to be above the locks at Orton, from where Abbi Kendall and Rob Wright shared a huge net of skimmers and bream recently from the pegs in the first field. Ferry Meadows continues in good form too. Pleasure anglers have had some good nets of fish and in the weekend Steel City Open match both Gunwade and Overton fished quite well. Leading the way from Overton peg 104 was young superstar Sam Collett. He fished a groundbait feeder at around the 50-yard mark and caught fish going close to double figures to finish with 66lb. Phil Irvine came second off Gunwade Lake with 59lb 12oz, followed by Mick Reeves on 54lb. Over the next few weeks Ian Burdett will be running the open matches on this water. Call 01162 600850 to book in or get further details. Sunday’s Peterborough & District AA members match on Ferry Meadows high bank proved to be difficult with bright sunshine and very calm water. First was Mike Smith on peg 35 with 12lb 8oz. He caught hybrids at 11 metres on the pole using sweetcorn and feeding hemp and corn. Second was Peter Molesworth on peg 42 with 8lb 14oz and third Rob Allen with 7lb 14oz. On Sunday round one of the King of the Fens team match took place on Tydd Gote waters. Bob Bates took first place catching three tench and a few roach on the feeder with worm for 18lb 2oz. Huntingdon rod Kye Jerome came second with a net of roach caught on the pole weighing 12lb 3oz, then came Paul Spriggs with 11lb 7½oz. On the team front local sides Sensas Mark One Green and the Black team tied on points with the Greens coming out on top with a weight advantage. Browning Hotrods came third followed by Top Guns in fourth. 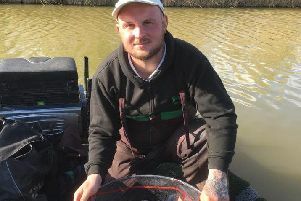 Ivan Marriott took top place in the Stokes No1 Cup, fished by the Yaxley, Farcet, Holme and District Angling Club at Monks Lode. Fishing on peg one, Marriott opted for a shallow waggler rig fished tight to the huge lily bed on the far bank to finish with 3lb 10¾oz. At the next peg was runner-up Lionel Whaley. He also opted for the waggler method tight to the lily bed, but used pinkie hookbait for 3lb 8¾oz. John Furnell was third with 14¾oz.